Yes, that is "Elvira" and won't change. Ron suggested not interrupting the flow of the artwork by putting the name as a Tattoo on the arms, but rounding it around the tail. It is the figure of a woman with abalone for the eyes (if I have the skis on the correct feet). If I have them reversed then I'm not sure how it looks. One of the things I really liked about at least one of the skis that Ron and Phil were working on was the flow of the artwork across both skis. Yes, that is "Elvira" and won't change.? Ron suggested not interrupting the flow of the artwork by putting the name as a Tattoo on the arms, but rounding it around the tail.? It is the figure of a woman with abalone for the eyes (if I have the skis on the correct feet).? If I have them reversed then I'm not sure how it looks.? The effective edge length you posted was interesting. I am going to have to measure my SS mags for a comparison. I may ask for both sizes. I pretty much know in advance that the 178 is too short especially after getting the running length measurments. If I wanted it for a 1 ski quiver maybe I woukd coinsider the 178. I really want a solid powder ski (in MT you don't 120mm under foot like you might in Tahoe) that has a tight turn radius. I skied the Scott P4's in a 181 and they are way too short. They have especially large twin tips and a short running length. If they are willing I may try the Howitzer and or the Bomb Squad (actually looks preferable as it only has tip rocker and none on the tail). I will give a full report and review after I ski them. We pretty much know in advance that I won't have the ski out in the ideal condition, fresh snow off piste. Odds are we will be skiing man made groomers at Loveland. That makes sense to me. I just measured my SS mags and the effective edge length is in the 1585 mm range if I measured right. I laid one on the ping pong table and measured from where the tip and tail met the table. That would make the 188 possibly ski shorter, especially with the twin tip in deeper snow. Interesting. almost all rockered skis are now going to be in the 186-189 range. the effective range can vary however. 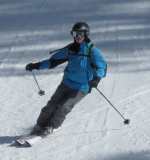 One thing to keep in mind is that many have gone to a low, long taper with a very low rise, although the ski may not have contact on a hard surface, it will on soft snow. They will pivot a lot easier but just keep in mind that all rockers are not the same! In the case of the Chariot, it's not rocker at all. It's just some very long twin tips that reduce the running length. ahh, i see! Yeah a very uber mini-rocker almost. very elongated tip/tail profile. Interesting! So for me, the healer showing his teeth at me while I go into the teeth of some new challenge would be good vibe! I'm a healer, and those bad boys would be just the mojo I need to keep my bones intact. Ok, so I may have to borrow a black cat bone just to be on the safe side. But in NC we have some root doctors that can pull that off. Come to think of it, Lynn is going to the MOJO capital of the world, too much funny medicine down there. See what happens when you take what starts as a good thought and run it aground just before bed? I need sleep. If your curious google "root doctor"
They only make about 5 pair of skis a day, and with both the RealSkiers and FreeSkier recognition, the window of opportunity might be closing.? Methinks you need to pull the trigger on a pair of Ullr's Chariots or Rave's in the "Healer" top-sheet (maybe even request Onyx eyes).? Lean those little big puppies up against the office wall (write off the cost as office furnishing, of course) and let the poeple know that the skis are YOUR Mojo (no Head ski pun intended).? You could even have Ski Logic inlay "root doctor" as your official ski-name (even though you clearly aren't)? By the way everyone should check out the SkiLogik web page again.? They have the RealSkiers and FreeSkier ski of the year results announced. Of course, therein lies another disadvantage of having 'skis of the year' -- the SkiLogik web says "First Place in Performance of 286 skis tested". Well, performance isn't defined, and there are lots of areas of performance where other skis were reviewed better and rated higher than the UC. (but we already had that conversation). OK, I searched! Oh herbal healers, some good results coming from the use of some of those herbs and remedies, look for the good! I didnt know that design was called the healer. Yeah, Freeskier really pumped the Howitzer for sure. You are correct, the inventory and potential production of those is going to be tapped quickly. So many great skis. CNBC Write-up on SkiLogik and You-tube posted by Bent Gate Mountaineering of Golden last spring (they plan to carry the line in the fall. Perry/Jbotti:? Better grab fast and then sell if you don't like them.? I think there will be a market to resell if you don't like, but they may soon be in short supply. very cool and that's great for them! Buy now, you can always take a look and return. I am going to be stubborn on these. I am demoing in November. I will hope that if I love them, Dave will find me a pair or make me a new one!! I also think that there will be a much smaller market for the chariots than for some of the other Ski Logik skis. We are a small fraternity that actually likes sidecut. Most skiers actually hate it especially in powder skis.